Since our founding in 1949, Grand Canyon University (GCU) has been a Christian college with a biblically rooted mission. Founded as a Baptist university, today GCU is an interdenominational university that welcomes students from all backgrounds. Throughout its rich history, GCU has remained a vibrant Christian university that is committed to distinctively Christian beliefs, values and practices in accord with its mission and vision. While the university is clear about its identity as a Christian university and its foundational convictions, we are intentionally committed to living out the faith within the context of a missional community. A missional community is a community of people strategically united in carrying out a mission that centers on following Jesus Christ in word and in deed, and in sharing the love of Christ generously to all who participate in the life of the community. Following Jesus in this way requires selflessness, sacrificial service and an ever-increasing love of the Lord and our neighbors. At GCU, we believe that right doctrine is essential and we are committed to the foundational beliefs that distinguish Christianity from other worldviews. Yet we are convinced that right practice is just as important and that following Christ must involve a living faith that is active and transformative for the individuals and the community that we serve. Missional communities differ from what may be called covenant communities, in which all members of a school commit to affirming and practicing the same faith. While a covenantal approach may be appropriate for some colleges and universities, GCU has intentionally cultivated a missional community and a culture that is characterized by a welcoming spirit and loving service to all. As a missional community, GCU has the unique opportunity to welcome students from all walks of life, some of whom may experience Christianity for the first time at the university. As a Christian university, we integrate faith, learning, work and service in an effort to honor God in all that we do, and we encourage others to join us in these endeavors. The mission of Grand Canyon Theological Seminary is to develop leaders, ministers and scholars who rightly handle God's Word, teach what accords with sound doctrine and equip the people of God for missional service within a rapidly changing world. GCU's identity and mission have remained deeply rooted in "the faith that was once for all delivered to the saints" (Jude 3) for nearly 70 years. As an interdenominational university, GCU's community is a product of the wonderful diversity of traditions and denominations that have grown out of the roots of biblical Christianity. Yet in the midst of this rich diversity, the university has consistently cultivated unity around the core doctrines and common practices of the faith. Our work on campus and within the community flows from a vibrant faith and concern to honor and emulate Jesus Christ in all we say and do. Our Christian convictions, Christ-focused curriculum and service beyond the classroom provide a foundation that is the bedrock of our community and basis for work together.This foundation simultaneously serves as a reminder of who we are and a statement about who we strive to be. This one foundation continually guides our learning and working communities toward faithfulness, excellence and service to God and our neighbors. GCU's foundational documents help define who we are as an institution and as a community. Christian principles are integrated across everything we do at GCU, including learning, work and service. These foundational documents articulate our beliefs, ethical foundations and commitment to God and Jesus Christ as the one true Savior. GCU’s Doctrinal Statement affirms our faith and beliefs as a Christian institution. The Doctrinal Statement outlines our commitment to the full inspiration of Scripture and brings our mission and identity into clear focus. GCU’s Ethical Positions Statement outlines our beliefs on moral truth, creation, human life, salvation and more. Our goal is to provide clarity, unity and alignment across the university on matters of ethics and morality. GCU is committed to integrating faith across all aspects of the GCU community, including work, learning and service. This initiative stems from GCU’s mission to educate students from a Christian perspective and to prepare them for careers that honor God while serving others. Faculty and staff are committed to honoring GCU’s Christian beliefs, values and practices in accord with our mission and vision, while students receive an education from the context and heritage of our distinctively Christian worldview. One way we integrate faith and learning is by weaving our Christian worldview across curriculum in all of our degree programs. Each program’s curriculum is collaboratively developed and centrally managed in a manner that integrates the Christian worldview and incorporates biblical principles. From the first course to the last, it is the university’s goal that all of our graduates be able to express aspects of the Christian worldview which affect human value and dignity, ethical decision-making, academic disciplines and vocation. By incorporating the Christian worldview into our curriculum, our graduates have the opportunity to gain the skills, knowledge and values-based foundation to carry out GCU's mission of preparing learners to become global citizens, critical thinkers, effective communicators and responsible leaders. It is through values-oriented learning experiences that our students develop into empowered graduates who are prepared to lead and serve in the local and global community. The integration of faith, learning and work is the university's initiative to joining together knowledge of God and knowledge of the universe in order to develop a true understanding of our world and ourselves. GCU is devoted to the intentional and pervasive integration of the Christian worldview. The integration of faith and work is the application of that worldview within the context of work in ways that honor God and contribute to the advancement of society. Welcome to the Department of Spiritual Life at Grand Canyon University. Our purpose is to provide both traditional and online students with opportunities to grow spiritually by engaging them in activities that ultimately develop them into co-laborers with Jesus Christ for Kingdom impact. We are passionate about helping all members of the GCU community grow in their personal relationship with God. Our desire is to encourage you to know God's plan for your life and assist in equipping you to participate in God's purposes in the world. We hold weekly Chapel services, provide opportunities for global and local outreach, facilitate weekly Bible studies and much more. It is my hope that you enjoy a spiritually uplifting experience during your time here. At GCU, you will find intentional and Christ-centered programming through a variety of ministries to help these goals become a reality. I invite you to discover the various ministries offered, listen to our Chapel messages or stop by the Spiritual Life office to meet our staff. We are here to assist you in any way that we can. GCU offers weekly Chapel and The Gathering services during the school year. These services are an opportunity for staff, faculty and students to come together to worship, hear God's Word and connect with one another. Our student leader worship bands help engage students and staff alike in worship, while speakers from across campus and throughout the Phoenix area come to share truth as they teach from the Bible. Chapel can be streamed live each week from our YouTube channel. GCU offers weekly student-led small groups called Life Groups. A Life Group offers a place for you to form relationships, build community and grow spiritually through studying the Bible. The Life Group program is overseen by GCU staff who train and support student leaders, called Life Leaders, to facilitate small groups. Life Leaders are also available for prayer, spiritual counsel and support. GCU Hope provides spiritual direction and encouragement through various mini messages and videos. Our hope is to provide you with daily inspiration and resources that help connect you with the GCU community. 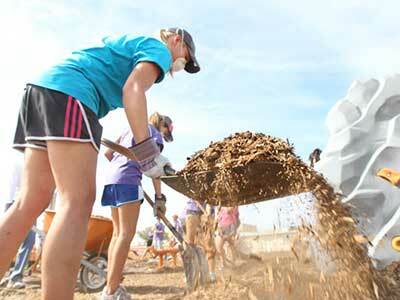 GCU students shovel dirt and soil to help lay the foundation for a new garden in an urban community. 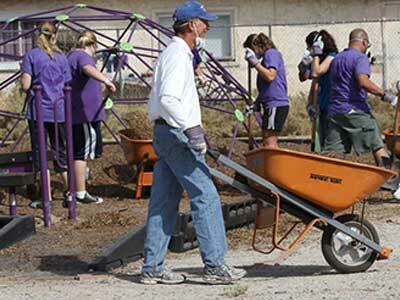 GCU President and CEO Brian Mueller chips in to help clean up parts of Phoenix that have been forgotten. GCU students give a new coat of paint to a local apartment complex to help those living there feel proud to call it home. 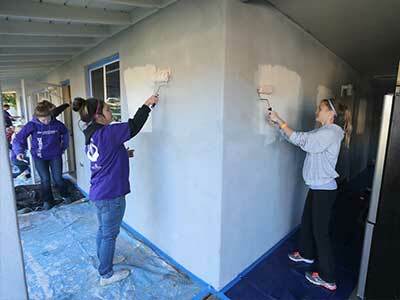 A fresh coat of paint helps give a facelift to homes in the neighborhoods surrounding GCU. 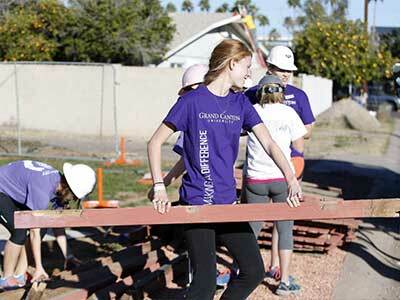 GCU students help move old pieces of a rotted fence to make way for a new one in local neighborhood. 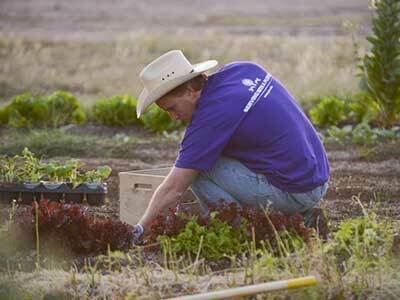 Fresh produce is harvested by Lopes during one of GCU's annual Serve the City events. 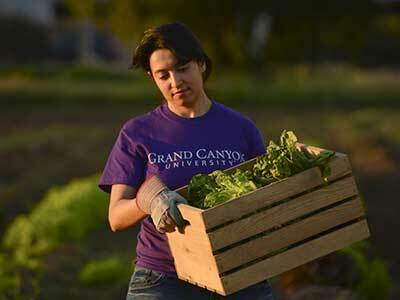 Urban gardens flourish from the ground and help provide fresh vegetables to local communities. Local Outreach and Global Outreach exist to mobilize our campus to become kingdom-minded. Our goal is to ignite a passion in the student body to have impact throughout their lifetime as they learn to make disciples in our community and across all nations. The GCU Department of Spiritual Life offers numerous opportunities to participate in Local Outreach programs, from Serve the City to Canyon Kids and so much more! These projects allow you to minister and give back to your local neighborhood and community, making the area around GCU a better place while providing you the opportunity to live out the gospel. This trip was a lot of firsts: my first trip with GCU, first trip to a developing nation, first time teaching, first time evangelizing and first time I helped lead a trip that was longer than three days. I feel more and more at home in the mission field each time I enter and I ask for prayers as I continue to follow God's mission. Global Outreach allows students on our main campus to experience God's heart for the nations. Each year, GCU students journey to locations around the world to help deliver the hopeful message of Jesus Christ and to experience transformation as God gives students glimpses into how He is at work around the world. Examples of past Global Outreach trip locations include Thailand, Fiji, South Africa, Costa Rica, Peru, Brazil, Mexico, Kenya, Wales and India. Want to see what our global mission trips are all about? We invite you to take the journey on The Narrow Path. 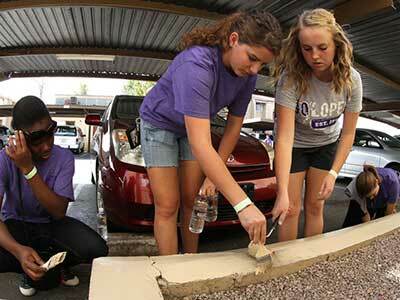 Watch as several GCU students immerse themselves in the beautiful culture of Honduras.